Let’s be clear, we’re not trying to pull the wool over anyone’s eyes…our often inclement weather is no secret. Still, it’s reassuring to know that foreign visitors who set foot on our green and pleasant lands don’t love Britain any less because of the rubbish weather. ‘Could you tell me the way to Big Ben? Behind the blanket of fog you say? 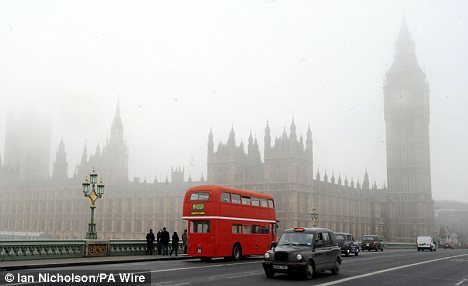 Thanks…’ 1000 tourists questioned said they wouldn’t be dissuaded from visiting Britain because of the weather. New research from VisitBritain has found that tourists – from more than 30 countries worldwide – wouldn’t be put off visiting our shores by the prospect of grey skies. 1,000 potential travellers were asked how much they agreed with the line: ‘I would not want to visit Britain because of the weather there’. On a scale from 1 to 7, where the latter was ‘strongly agree’, the average score came out at 2.76 – a clear vote of confidence that poor weather rarely dissuades tourists from actually visiting. It seems foreign travellers are under no illusions that they’ll be met with sunshine though, with around half of those questioned agreeing that ‘wet and foggy’ was an accurate general description of British weather. VisitBritain chief executive Sandie Dawe said: ‘This survey shows that Britain’s weather is not as bad as folklore would have us believe. A brush with an umbrella doesn’t detract from the appeal of the country’s museums, castles and ancient attractions, continues Dawes. It never rains on my tours – and thats a promise! I have 1000’s of satisfied customers who have toured with me who will vouch for me. This is the sort of weather I prefere, I only wish that England would not close for winter!